Intriguingly, on the cover of the copy I was sent to review it says 'Top Secret, Uncorrected proof'. On the fly leaf, the official looking stamp urges me not to leave the book on a train, plane, in a car or on the bus. On the back it says 'get ready for a new Dark Age', because, as it turns out, the main protagonist is called Paul Dark. Perhaps this tells you that the book is rather 'tongue in cheek' and not entirely to be taken seriously. The book is set in 1969. Paul Dark works for MI6 as a spy, and is summoned to meet up with his chief to discuss the defection of a colonel in the KGB, Vladimir Slavin, in Nigeria, who has promised to spill the beans on a British agent recruited to a Russian intelligence organisation (NKVD) in 1945, a 'secret secret' service. Unfortunately, it is immediately clear to Paul, that the agent in question is himself and he needs to take steps to make sure he is not uncovered. Paul was recruited to NKVD at the end of the Second World War. He was helping his father to kill suspected Nazi war criminals in a secret mission, codename Sacrosanct. But he then discovers that his father may have been a facist, despatching Soviet agents instead. His father commits suicide, and Anna, the nurse who apparently fell in love with Paul, told him the truth about his father, and tried to recruit him, is also apparently killed. As a result, Paul decides to sign up for NKVD. Now the defecting Slavin says that Anna's death was faked, and that she successfully recruited a British agent involved in Sacrosanct in 1945 to NKVD. Paul not only has to prevent anyone finding out that he is the double agent, but he also wants to find out if Anna is still alive, and the truth about what really happened in 1945. Paul's quest to find the truth is set on the backdrop of Nigeria in 1969, which is in the middle of a violent civil war, and he arrives in Nigeria just before the impending visit of Harold Wilson, a possible assassination target. Can he find the truth and also save the day? The book is well plotted and doesn't take itself too seriously. Paul's serial escapes from dangerous situations become increasingly miraculous, as the bodies pile up around him. This book does not have the depth and menace of spy stories from John le Carre, but this is enjoyable 'boy's own stuff' through and through. 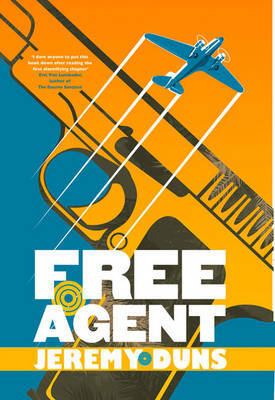 Read another review of FREE AGENT.